NASA has revealed a new image taken by New Horizons spacecraft. This image [offers a departing view of the Kuiper Belt object (KBO) nicknamed Ultima Thule – the target of its New Year’s 2019 flyby and the most distant world ever explored]. 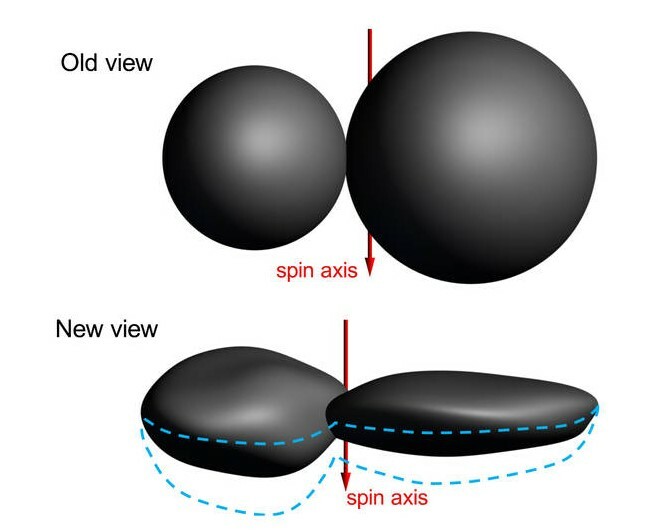 Ultima Thule is a trans-Neptunian object located in the Kuiper belt. It is a contact binary 31 km long, composed of two joined bodies. It is classified as a classical Kuiper belt object. Ultima Thule is considered as the farthest and most primitive object in the Solar System visited by a spacecraft. There are also upcoming images which will come soon; they are the final views New Horizons captured of the KBO (officially named 2014 MU69) as it raced away at over 31,000 miles per hour (50,000 kilometers per hour) on Jan. 1. New image contains very useful information about the shape of Ultima Thule which is situated over 4 billion miles away from Earth. The images in this sequence will be available on the New Horizons LORRI website this week. Previous Previous post: Which Planet Has the Longest Day in Our Solar System?